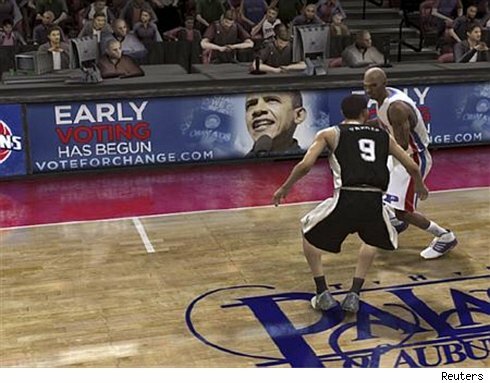 There have been many reports — and pictures — of video games on the Xbox 360 being filled with ads promoting Senator Barack Obama (and soon, most likely Senator John McCain if that’s the way things are headed). I know this might not bother most people, and it isn’t terribly annoying to me, but I fear this path and where it may lead. It’s one thing to see a Snickers or Sprint ad in a game of Madden (they’re both 2 big NFL sponsors), or a T-Mobile or Sprite ad in a game of NBA Live 09 or NBA 2k9 (T-Mobile and Sprite are big NBA sponsors- NBA 2k9, by the way, is not yet listed anywhere as receiving these in game ads); those ads give the game a more realistic feel. But now that the ads are expanding to other topics not related to the game (i.e. politics), this new direction isn’t really not sitting well with me. I don’t wanna start seeing an ad play during halftime of one of those games telling me the problems with the other candidate. And if they are putting in these little ads on the sidelines 3 weeks away from the election, whats to say they won’t put in other, bigger ads as we get closer to November 4? I understand video games are insanely popular — especially with us teens — but if the companies and sponsors want to go out and start filling our games with ads to make a little more $$$, why can’t we the customer see the price of games drop and not have to pay $60 per game. That, or keep the ads to a minimum (and if at all possible- relevant to the game like T-Mobile in the NBA and Sprint in Madden). 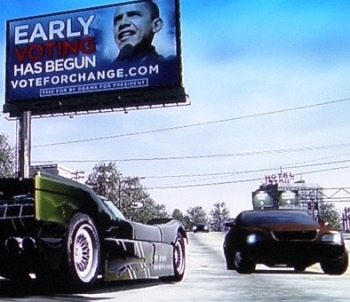 What you think- are you noticing some of these election ads popping up in some of your games (particularly Madden 09, NBA Live 09, Guitar Hero 3, and Burnout Paradise) you seeing them in other games (if so which ones)? More broadly, do you mind the increasing appearance of ads in games or believe the games should be cheaper in light of them? Let us know your thoughts in the comments. Posted on October 17, 2008, in Video Games and tagged barack obama, Burnout Paradise, guitar hero 3, john mccain, madden 09, NBA Live, politics, technology, us election, Video Games, xbox 360, xbox live. Bookmark the permalink. 1 Comment. The reason Obama/his team chose video games is because he knows teens and those in their early 20s are very impressionable. It also comes down to “who’s cool” to vote for. Meanwhile, i didn’t hear of any ad McCain had in video games. You have to be a real narcissist to want your face shown everywhere in an attempt to get elected; which is all politicians. But Obama took it a step further. And, unfortunately, this country is really starting to pay for the decisions of ignorant, mesmerized voters who cast their votes last year voting for Obama. I personally think gaming companies should impose a rule of no political ads in games.